A Senate committee takes up President Obama’s nomination of Jeh Johnson today to succeed Janet Napolitano as secretary of Homeland Security. While GOP lawmakers have questioned Johnson’s lack of expertise in some areas as well as his past role as a fundraiser for Obama, there’s at least one thing most Republicans and Democrats have in common: majorities have a favorable opinion of the agency Johnson was named to lead. Overall, 66% of Americans have a positive view of Homeland Security, which ranks it behind the Center for Disease Control, NASA, the Defense Department and the Veterans’ Administration, according to a survey last month. (The agency with the worst public image is the Internal Revenue Service which is seen unfavorably by 51%). The favorable opinion of the agency created after the Sept. 11, 2001 terrorist attacks extends across partisan lines, although Republicans are about 14 percentage points less enthusiastic about it than Democrats. 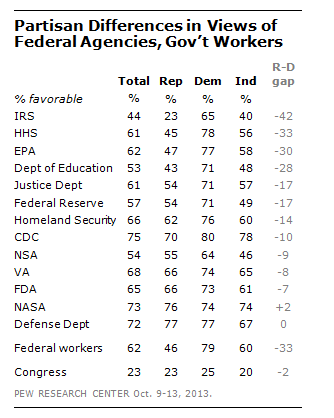 About six-in-ten (62%) of Republicans, 76% of Democrats and 60% of independents see the department favorably. Homeland had fared less well in a survey conducted March 2010. Just 43% said at the time it was doing a good or excellent job, while 53% rated its efforts only fair or poor. A key responsibility of the department, which started as the White House Office of Homeland Security and was elevated to cabinet status in 2003, is to protect against terrorism on domestic soil. Americans have mixed views about how much government can do to prevent attacks. A survey conducted in April after the bombings at the Boston marathon found that while 60% of the public believed steps taken by the government as a whole had made the country safer from terrorism, a smaller number (49%) said there was more the government could do to prevent such attacks while 46% said there was not much more it could do. The April survey did not ask specifically about Homeland Security.